Lothian Thistle Hutchison Vale recorded the biggest result of their history as they knocked League Two outfit Montrose out of the Scottish Cup at Links Park. Willis Hare scored seven minutes into extra time to give the East of Scotland League champions a 2-1 victory. Thistle will travel to face Highland League side Huntly in the third round. In another replay, Stirling Albion beat League Two rivals East Fife 1-0. 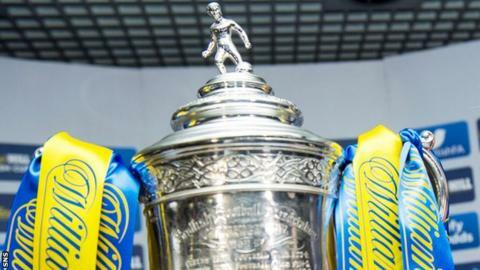 They next host cup debutants Cumbernauld Colts of the Lowland League. Striker Steven Doris scored the only goal of the game at Forthbank Stadium in the 14th minute, the sides having drawn 0-0 previously at Methil. Montrose hosted their replay after a 1-1 draw at Saughton Enclosure. Striker Scott Gormley gave the amateurs the lead after 15 minutes and, although midfielder Terry Masson equalised on the half-hour mark, it was the East of Scotland League side who prevailed thanks to defender Hare. Lothian Thistle were founded in 1969 as an amateur works team for Lloyds Finance, initially competing as Lloyds & Scottish. Because of the club's link with youth football club Hutchison Vale, they again changed their name at the start of the 2011-12 season. They won the East of Scotland Premier Division for the first time in their history in 2013-14 and retained the title last term.